Before you start making videos with your Smartphone you will need to invest in the right camera app. All Smartphones usually come with some form of camera app as part of their operating system. They can vary from being good to useless. 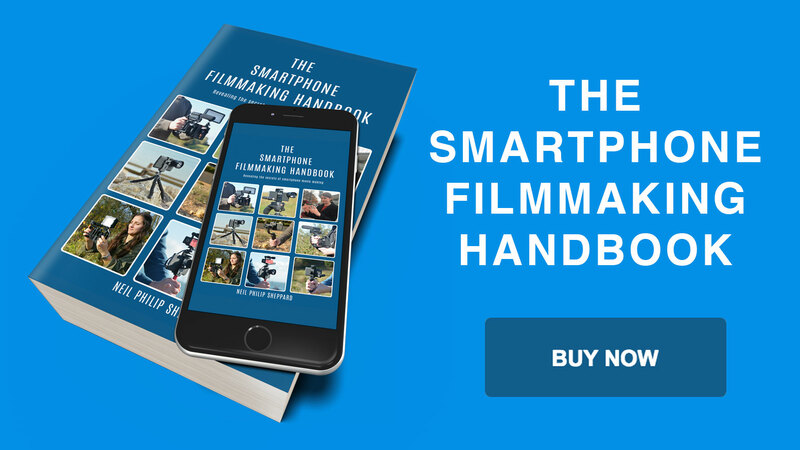 When it comes to shooting video you will quickly realise that most camera apps installed with the Smartphone are not good enough for the job of making movies. Luckily there are a few camera apps on the market that will soon get you’re little box of tricks ready for shooting pro video. Choosing the right camera app for your Smartphone can be difficult but it is important to get right. It needs to have the right blend of pro features but is not difficult to use. Camera apps come with multiple choices for shooting video with your Smartphone but not all are great. Some don’t have manual controls for shooting video and some are so time-consuming to change settings that they are just not worth it. 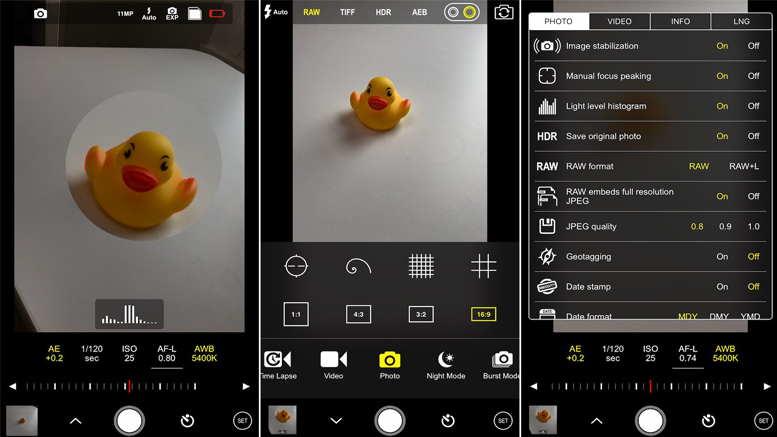 So which camera app should you buy? I would like to say the app market is full of fully featured camera apps for making videos. Sadly this is not true. As mentioned elsewhere in this guide most of the camera apps available do not have audio monitoring or audio peak levels. If your purpose is to make videos that do not need any sync sound then this will not be an issue for you. Some apps have special features like slow motion that might be useful for certain jobs. If however you do want sync sound, and I would say that most videos do, you need to make sure you get this feature in the camera app. Other features you won’t find in the supplied camera app are control over the focus and exposure. It is important to have manual control over these settings. There is nothing worse than watching a video where the focus in constantly shifting in and out and the exposure won’t stay fixed because of changing light. These features need setting and locking so your video will stay in focus and have the correct exposure. Only pro camera apps have these features. To be a good filmmaker you will need to gain control over the focus and exposure of your video. Besides setting the exposure and focus you will need to get control over the frame size, frame rate and bit rate. These settings are important if you want control over the quality of your video. 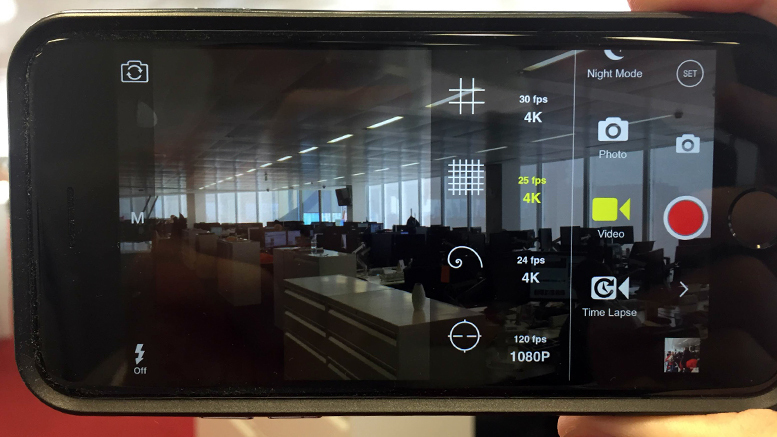 If you want to shoot 4K at 100mbs with a frame rate of 25 you will find it difficult with the supplied camera app. These features do become available with a pro camera app like Filmic Pro. Having control over these settings also means you get the best quality video that your project needs. You should also be aware not all functions that are available in a pro camera app are accessible with all Smartphones. Older versions of the iPhone will not shoot 4K and some Android Smartphones will not shoot video at 25 frames a second. So to get the most out of a pro camera app you will need to have a recent model Smartphone with a high specification. That said if you are only planning to shoot 1080 HD video you will find that most Smartphones will be able to do this. So here are my recommendations for Smartphone camera apps. All the camera apps listed feature professional camera controls for your Smartphone. Some are only specific to iPhone, Android or Windows Phone. So please check the camera app is available for your OS before you go searching for it on the app store. Also please note that camera apps are constantly updating so please check the camera app you are looking at has all the functions you need before you buy it. 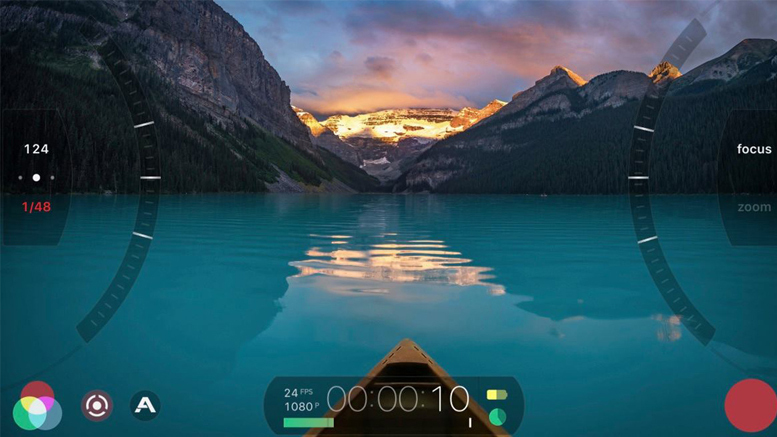 One of the most popular video camera apps is Filmic Pro. 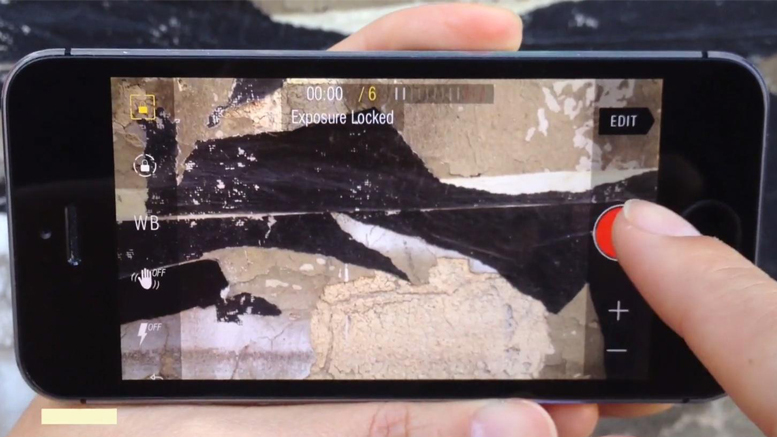 It’s been used for countless productions on iPhone and even for feature films like Tangerine. Filmic Pro has been around for a while now but continues to get better with every new release and it has many advantages for shooting pro video. 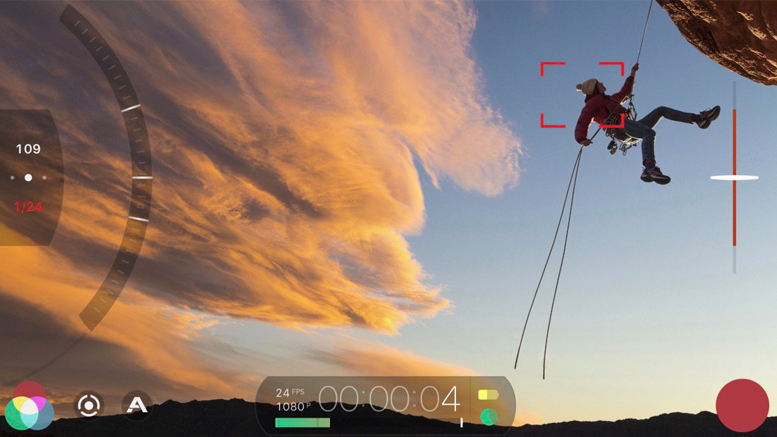 Filmic Pro will turn your Smartphone camera into a fully featured video camera. It has zoom controls, multiple frame rates, manual control over focus, exposure, white balance and shutter speed control. It also has audio monitoring for getting good quality sound and it has manual audio gain control. 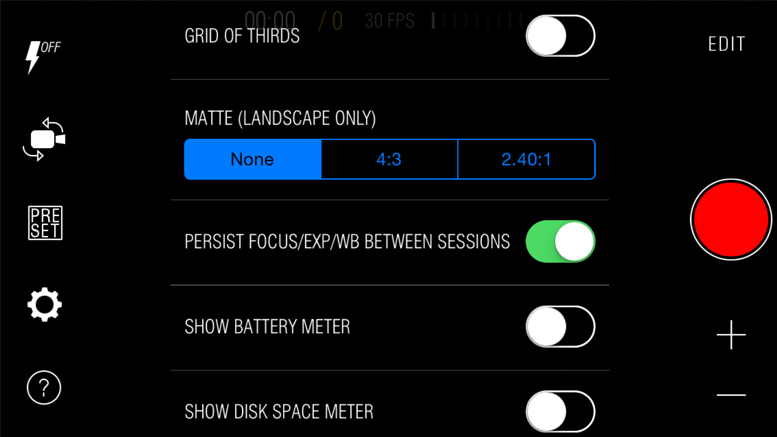 Filmic Pro also has aspect ratio guides and different resolution settings. You can set the frame size to 16:9 (widescreen), 4:3 (old TV standard) and 1:1 which is good for social media. The higher frame rates go up to 240 frames a second which gives you choices for slow motion and you can also do time-lapse. If you need to add Meta Data to your recordings you can add this information into Filmic Pro so each shot will have a place and time. You can save all the settings as presets so you don’t have to keep opening menus and change settings every time you make a new video. 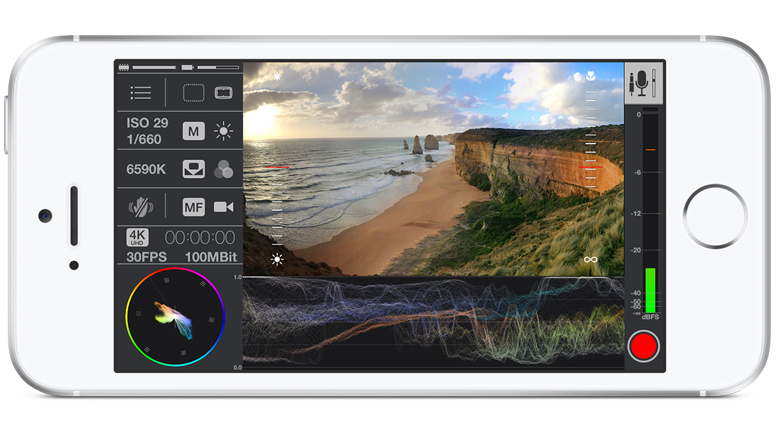 Filmic Pro will record up to 4K video at 100mbs which is extreme high-quality from a Smartphone. Be aware though that your Smartphone must support this feature to be able to use it. On newer iPhones it can also record in LOG format. This means a flat picture profile which is the best image for colour grading. 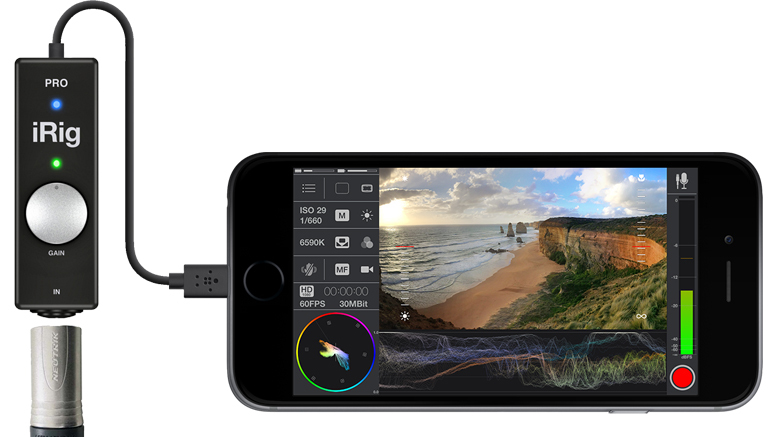 Filmic Pro also supports third-party hardware. If you add the Moondog Labs Anamorphic lens to your Smartphone the image will stretch and you will find it difficult to view it. 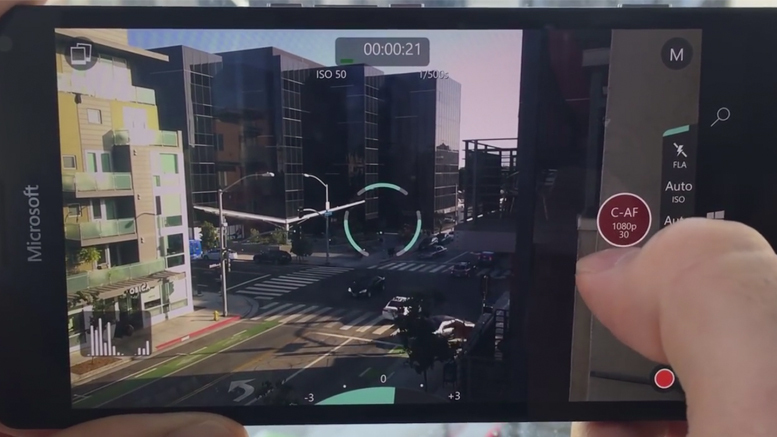 Filmic Pro will adapt to this lens so you can view the image correctly. It will also adjust to Nikon or Canon DSLR lenses. There is also a classic version of Filmic Pro for older iPhone models. So if you do have an older iPhone there are choices for you to use Filmic Pro. Be aware though that you will only have access to limited functions because of the technology limits in the older models. 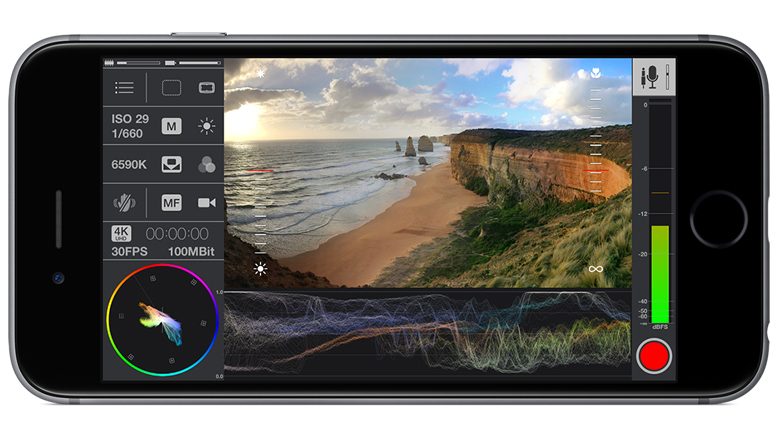 Until recently Filmic Pro was only available for iPhone and iPad users. 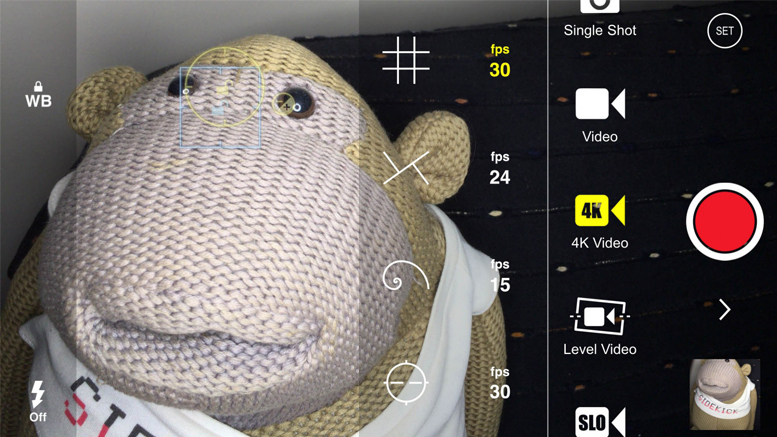 Android users could only look on with envy at the features that Filmic Pro gave the iPhone. But now after months of development the Filmic Pro team have now released a version of Filmic Pro for Android. 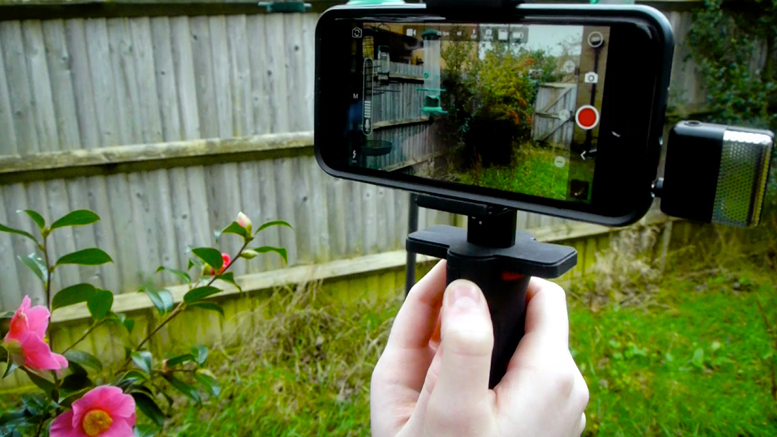 Just like on the iPhone, Filmic Pro turns your Android camera into a fully featured video camera. Most of the functions that are available for the iPhone are available on Android. However users should be aware that because of the many makes and models of Android smartphones not all Filmic Pro features will work and you should check the app supports your Smartphone before you download. 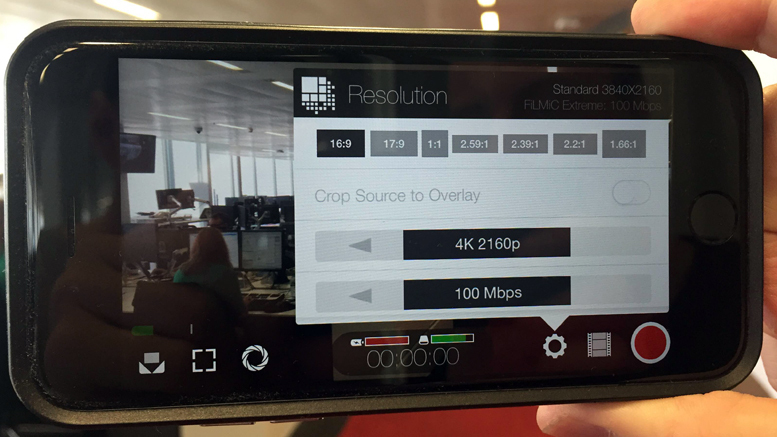 If you don’t want to use Filmic Pro on your Android Smartphone you could try Cinema FV-5. This app started life a photography app but the developers created an improved version just for video. 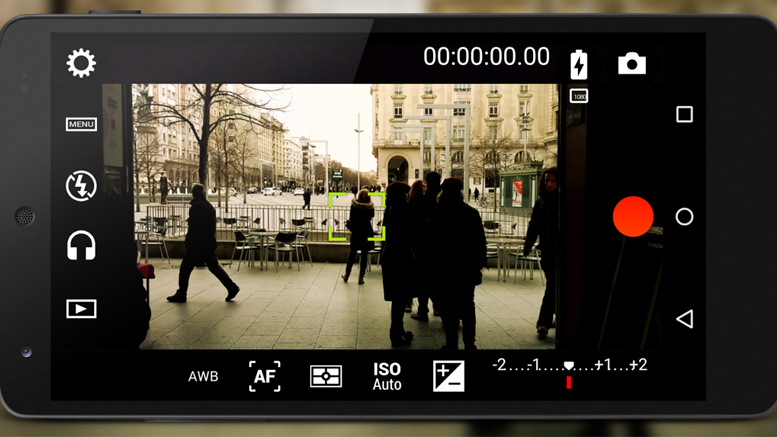 It has many of the same functions as Filmic Pro and is only available for the Android operating system. This means it works great on Android Smartphones. Cinema FV-5 provides you with many professional video settings and full manual control over your Smartphone’s camera. This includes exposure compensation, ISO control, light metering, manual focus, white balance, zoom, different frame rates and bit rate alternatives. It also of course has audio monitoring so you can check your levels for sound. Just like Filmic Pro you can add Meta Data to your videos so you know where and when you made them. You can also choose different frame sizes which will go up to 4K resolution if your Smartphone will support it. I would say that because of the many makes and models of Android Smartphones not all functions are available on some Smartphones. This means you will not be able to get access to all the features the app has to offer because of the different technology in Android Smartphones. However I still think that Cinema FV-5 is a great choice for Android. 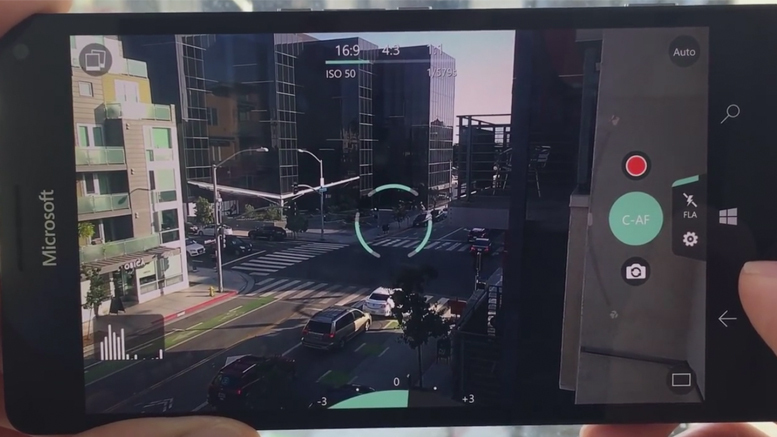 For Windows Phone a good choice for a video camera app is Proshot. This app has many useful features that will give you full control over your Windows Phone’s camera for doing video. Just like Filmic Pro you will be able to get full manual control which is essential if you want to use your Windows Phone for doing professional videos. ProShot will give you full manual control over exposure, shutter speed and white balance. It also has time-lapse for longer takes if you want it. You also get full image control, which means you can change image size right up to 4K resolution and you can change the bit rate for higher quality videos. You can choose between 16:9, 4:3 and 1:1 video sizes so you have plenty of choices for all formats. There is manual focus assist and digital zoom if you need to get close to your subject. Another feature is the histogram so you can gauge correct exposure settings. ProShot has audio meters so you can accurately see your incoming sound and adjust it if it is too loud or too quiet. Other features include a battery meter to see how much power you have left in your Smartphone and customisable presets so you can store your favourite settings. If you are an Android or iPhone user you can also try out ProShot as it is available for those operating systems as well. But be aware that just like Filmic Pro and Cinema FV-5 not all features are available depending on your make and model. Another great camera app for the iPhone is ProCam. Although marketed as a stills camera app, ProCam has an excellent feature set for video. It has all the manual controls you would expect including exposure, white balance, ISO, manual focus and shutter speed control. ProCam also has an impressive selection of frame rates. You can shoot at 24, 25 and 30 frames a second. You can also adjust up to 120 frames a second in 1920 x 1080. Resolution size is also fully adjustable and ProCam will record right up to Ultra HD at 3840 x 2160. If you like you can upgrade to super 4K with an in app purchase which will push the iPhone right up to a 4038 x 2268 frame size and 150 megabits a second. Other useful features include audio peak meters so you can see audio levels from a connected microphone. But be aware you cannot control gain like you can in Filmic Pro. There is also video stabilisation and a hard drive space indicator. Another feature is the built in video editor. This is not as fully featured as other dedicated video editing apps but might be useful for the odd quick trim if your video needs it. 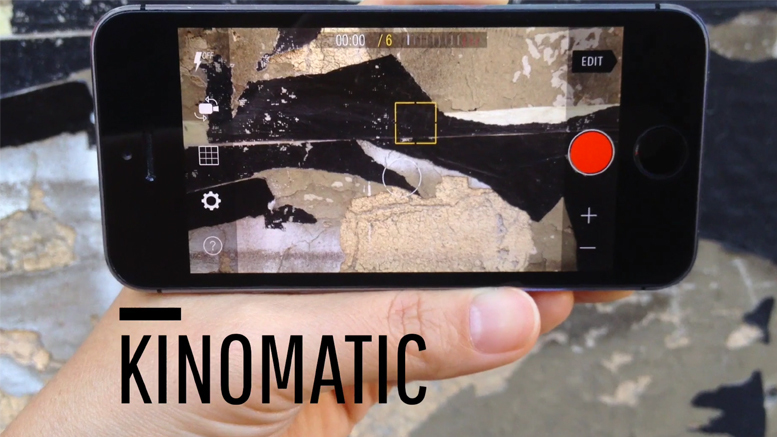 The Kinomatic camera and editing app is another great choice for iPhone. It has gone through many releases but recently added 4K to its impressive feature set. 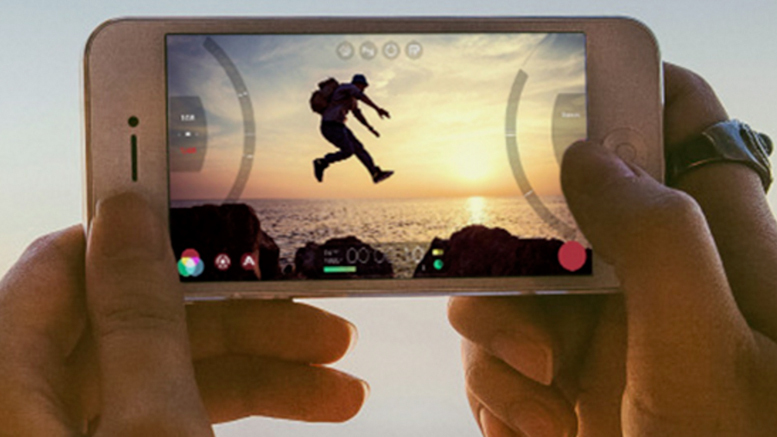 Many camera apps lack manual controls that enable you to shoot good quality video and audio. Kinomatic has none of these problems and its many features will appeal to the amateur and the professional. Recording video is straightforward and starts by just hitting the big red record button. At the left of the screen you can adjust exposure, lock the focus, add camera stabilisation and adjust white balance through a set of icons. At the bottom of these icons is the settings button. In here you can adjust all the settings for recording video. You can select 480p, 720p, 1080p and 4K. So you have plenty of choices for resolution. There are also frame rates from 24 up to 240. Below these settings you will see a monitor audio switch. Turn this on and you will see audio bars so you can see how loud the audio is. If you plug in an external microphone, this button will turn into an audio gain level control. This means you can turn gain up or down depending on how loud your audio is. Below the audio control you can select what audio codec you want to record at. You can select compressed AAC or uncompressed with a bit depth of 32. So if you want good quality audio Kinomatic has you covered. Other features you can turn on are the battery meter and the hard drive storage meter. These are handy for working out much power you have left on your iPhone and how much hard drive space you are using up with your recordings. Towards the bottom of the main icons on the left you will find a preset button. This is for saving your favourite filming preset so you don’t have to select a load of settings every time you use the app. This is useful for quick set-ups so you can get filming with a minimal amount of fuss. There is also a set of presets already set up for you. So if you not to sure with what to start with this will be a great help. Another great feature of Kinomatic is the built in Video Editor. In here you can import clips from anywhere on your iPhone and start building an edit. There are simple trimming tools for cutting down your shots so you can add them to the timeline. You can import any music tracks from your music library or import a voice over. You can also control audio in the editor so you can do some simple track mixing. Another feature is the titling tool. You can add titles to your final videos to give your finished movie the final professional polish that it deserves. 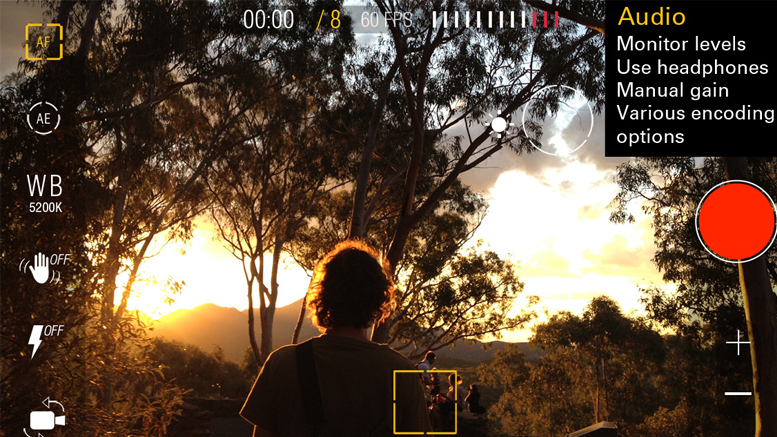 Mavis it a professional video camera app, that gives you full manual control over your iPhone’s camera. It is similar to Kinomatic and Filmic Pro and recently the designers updated the app to give it many new features. In the latest version they have redesigned many tools to give the app greater use in video production. The audio tools give full support for internal and external audio sources. You can connect a microphone by the lightning port or the headphone port and use Mavis to monitor and record the incoming audio. The app also has audio gain control for both internal and external microphones so you can have full control over your levels. You can also see where your audio is peaking with the audio meters. Another great feature in Mavis is real-time audio pass through. This means that if your microphone is capable of audio monitoring you can add headphones so you can hear the audio as it records. This is useful for making sure your audio records to a high standard. The viewfinder has support for Moondog’s Anamorphic lens and the Beastgrip DOF adaptor. This de-squeezes the image so you can see the image clearly after the lens correction. This makes framing shots a lot easier when using hardware accessories. This only manipulates the viewfinder not the recorded media. This means you will still have complete control over the method you use to de-squeeze your recordings in post-production. Mavis also has full colour control and gives you extensive manipulation over your image. The built in vector scope will help set up your colour values and your blacks and whites for perfect image exposure. This will show precise colour analysis of your scene as the iPhone camera sees it. You do this by setting a white or grey surface to the centre of the vector scope, it will then measure it to give you an accurate representation of white. There are plenty of resolution settings in Mavis. 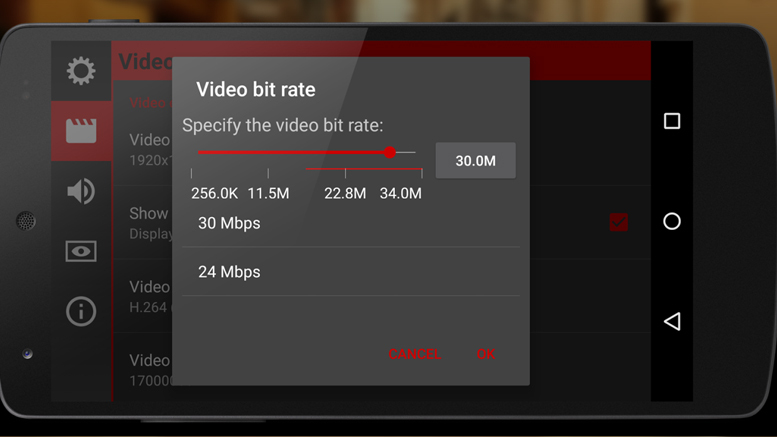 You can record in resolutions up to 4K with bit rates up to 100mbs. You can also select different frame rates up to 240 frames a second. You store these in quick set-up presets so you don’t have to keep adjusting settings. Video files save to the camera roll and in the Mavis app. You should be aware though the higher resolution recordings only save to the Mavis app and not the camera roll. Mavis works best in manual mode so it might not be suitable for the beginner. That said the focus and exposure controls are easy to use while shooting. If you are not in manual mode these displays show you what the exposure and focus are doing. Adjusting them immediately switches the app into manual mode. Menus on the left-hand side give quick access to various settings including the exposure and focus settings. I would say that this app is for the professional but if you are serious about your iPhone film making this is a good app to start with. 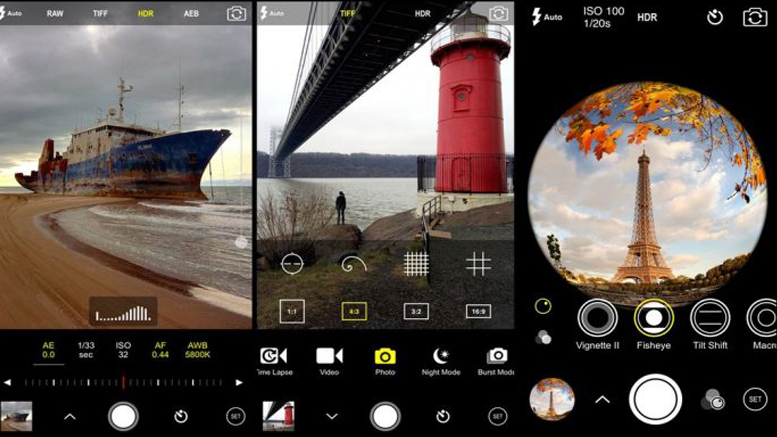 All these apps give you complete manual control over your Smartphone’s camera. Anyone will give you much better results than the supplied camera app. The list of features may seem overwhelming but don’t let that put you off choosing a dedicated camera app. If you are looking for a simpler approach to using these apps all you need to remember is to first set up a camera preset. An example of this could be 1080HD, 30 frames a second with a 50mbs bit rate. Once you have done this just remember to set and lock your exposure and focus before every take. This will get you by for most shooting occasions. But this only touches the surface of what these camera apps can achieve. 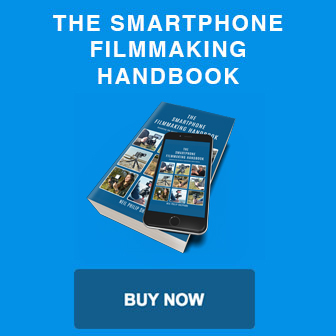 If you spend the time to understand and use all the available features you will be on your way to being a great Smartphone filmmaker.